Superworm is super long and super strong. His ability to help and entertain others makes him a real hero to all the garden creatures. But when Superworm gets kidnapped by the evil Wizard Lizard, all his creepy crawly friends need to work together to save him. This action-packed story is a real hit with children thanks to the bouncy rhyming verses and quirky illustrations. The story teaches children the importance of friendship and the power of working together to overcome problems. 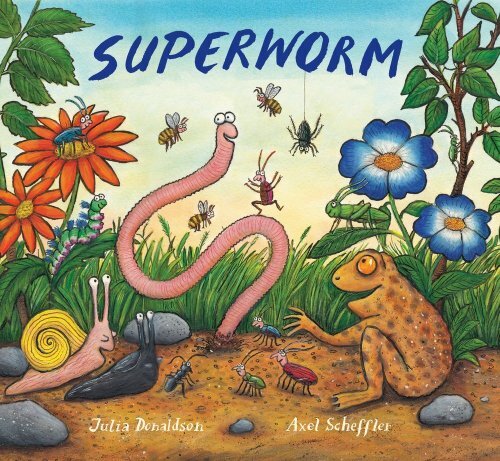 Julia Donaldson use of interesting vocabulary and descriptive language makes the story come alive. It also makes this book a great model text to use when targeting adjectives and action verbs. There are many examples of regular plural nouns used throughout the story, allowing children to listen to the correct grammatical models and practice using regular plurals as they describe the pictures or retell the story. The repetitive rhyming text in Superworm makes it a super choice when targeting the ‘s’ sound. For further speech and language targets in Superworm, see the list below.